Will Academia, Progressives and Political Correctness lead to the demise of America? Since the Boston Marathon Bombings there has been a renewed interest in Chechnya Mooslims, but then again we don’t want to jump to conclusions now do we? Being warned of approaching British troops by Dr. Joseph Warren and Paul Revere, Pastor Jonas Clark and his male congregants of the Church of Lexington (numbering 60-70) were the ones that stood with their muskets in front of the Crown’s troops (numbering over 800), who were on orders to seize a cache of arms which were stored at Concord and arrest Sam Adams and John Hancock (who were known to be in the area, and who had actually taken refuge in Pastor Clark’s home). According to eyewitnesses, the king’s troops opened fire on the militiamen without warning, immediately killing eight of Pastor Clark’s parishioners. In self defense, the Minutemen returned fire. These were the first shots of the Revolutionary War. This took place on Lexington Green, which was located directly beside the church-house where those men worshipped each Sunday. Adams and Hancock were not apprehended. A few of Pastor Clark’s men led them to safety as their Christian brothers were preparing to stand in front of the British troops. Sam Adams and John Hancock owed their lives to Pastor Clark and his brave Minutemen. According to Pastor Clark, these are the names of the eight men who died on Lexington Green as the sun rose on April 19, 1775: Robert Munroe, Jonas Parker, Samuel Hadley, Jonathan Harrington, Jr., Isaac Muzzy, Caleb Harrington, and John Brown, all of Lexington, and one Mr. Porter of Woburn. However, by the time the British troops arrived at the Concord Bridge, hundreds of colonists had amassed a defense of the bridge. A horrific battle took place, and the British troops were routed and soon retreated back to Boston. America’s War for Independence had begun! Yes, ladies and gentlemen, these two elements of American history are lost to the vast majority of historians today: 1) it was the attempted gun confiscation and seizure of two patriot leaders by British troops that ignited America’s War for Independence; and, 2) it was a local church pastor and his male congregants that mostly comprised the Minutemen who fired the shots that started our great Revolution. With that thought in mind, I want to devote today’s column to honoring the brave preachers of Colonial America–these “children of the Pilgrims,” as one colonial pastor’s descendent put it. It really wasn’t that long ago. However, with the way America’s clergymen act today, one would think that preachers such as James Caldwell, John Peter Muhlenberg, Joab Houghton, and Jonas Clark never existed. But they did exist; and without them, this country we call the United States of America would not exist. Caldwell was a Presbyterian; Muhlenberg was a Lutheran; Houghton was a Baptist; and no one really seems to know what denomination (if any) Jonas Clark claimed, although one historian referred to Clark as a Trinitarian and Calvinist. But these men had one thing in common (besides their faith in Jesus Christ): they were all ardent patriots who participated in America’s War for Independence, and in the case of Jonas Clark, actually ignited it. 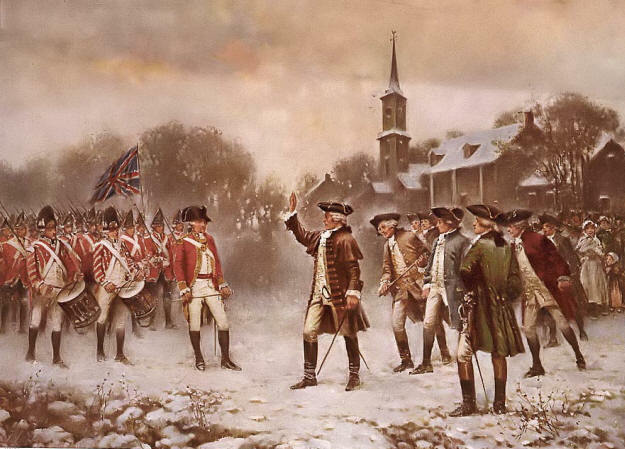 During the Springfield (New Jersey) engagement, the Colonial militia ran out of wadding for their muskets. Quickly, Caldwell mounted his horse and galloped to the Presbyterian church, and returning with an armload of hymnals, threw them to the ground, and hollered, “Now, boys, give ’em Watts!” He was referring to the famous hymn writer, Isaac Watts, of course. The British hated Caldwell so much, they murdered his wife, Hannah, in her own home, as she sat with her children on her bed. Later, a fellow American was bribed by the British to assassinate Pastor Caldwell–which is exactly what he did. Americans loyal to the Crown burned both his house and church. No less than three cities and two public schools in the State of New Jersey bear his name. Muhlenberg was later promoted to brigadier-general in the Continental Army, and then to major general. He participated in the battles of Brandywine, Germantown, Monmouth, and Yorktown. He went on to serve in both the US House of Representatives and US Senate. As I said at the beginning of this column, Jonas Clark was pastor of the Church of Lexington, Massachusetts, on April 19, 1775, the day that British troops marched on Concord with orders to arrest Sam Adams and John Hancock, and to seize a cache of firearms. It was Pastor Clark’s male congregants who were the first ones to face-off against the British troops as they marched through Lexington. 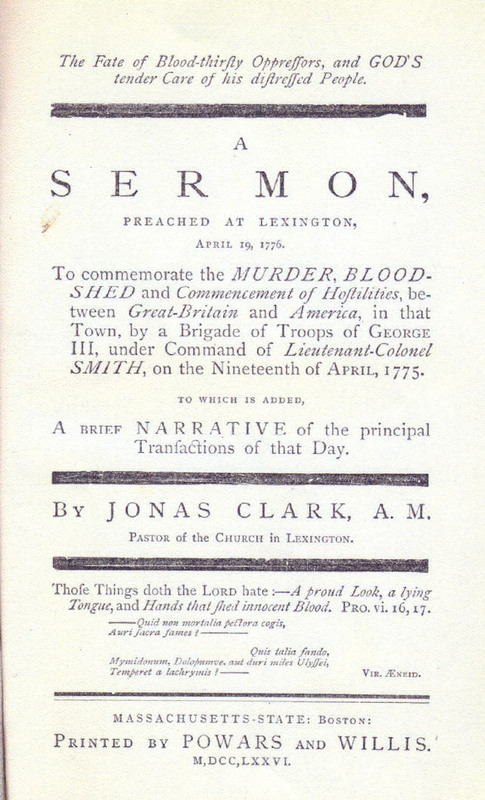 When you hear the story of the Minutemen at the Battle of Lexington, remember those Minutemen were mostly Pastor Jonas Clark and the men of his congregation. Of course, these four brave preachers were not the only ones to participate in America’s fight for independence. There were Episcopalian ministers such as Dr. Samuel Provost of New York, Dr. John Croes of New Jersey, and Robert Smith of South Carolina. Presbyterian ministers such as Adam Boyd of North Carolina and James Armstrong of Maryland, along with many others, also took part. And although not every pastor was able to actively participate in our fight for independence, because so many pastors throughout colonial America preached the principles of liberty and independence from their pulpits, the Crown created a moniker for them: The Black Regiment (referring to the long, black robes that so many colonial clergymen wore in the pulpit). Without question, the courageous preaching and example of colonial America’s patriot-pastors provided the colonists with the inspiration and resolve to resist the tyranny of the Crown and win America’s freedom and independence. This is the fighting heritage of America’s pastors and preachers. So, what has happened? What has happened to that fighting spirit that once existed, almost universally, throughout America’s Christian denominations? How have preachers become so timid, so shy, and so cowardly that they will stand apathetic and mute as America faces the destruction of its liberties? Where are the preachers to explain, expound, and extrapolate the principles of liberty from Holy Writ? I am absolutely convinced that one of the biggest reasons America is in the sad condition that it is in today is because the sermons Americans frequently hear from modern pulpits deal mostly with prosperity theology, entertainment evangelism, feelgoodism, emotionalism, and Aren’t-I-Wonderful ear tickling! One man recently wrote and told me that his ears had been tickled so much in church that he had calluses on them. This milquetoast preaching, along with a totally false “obey-the-government-no-matter-what” interpretation of Romans 13, have made it next to impossible to find Christian men with the courage and resolve to stand against the onslaught of socialism, corporatism, and, yes, fascism that is swallowing America whole. P.S. As this column was about to be distributed, I learned that the Lexington police have cancelled the rally on Lexington Green. The rally will instead be held in West Springfield at 2pm.